Last April, a group of environmentally minded Pittsburgh organizations that had been planning an office and research campus that will be the center of all things “green” received a $50,000 grant from The Heinz Endowments. The grant went to further study the need for the campus and continue formulating its scope, developing a business plan and selecting a location. The campus project, called Pittsburgh Green Innovators: Environmental Living, Learning and Earning Collaborative, would house an array of green-related activities, such as a training program for operating engineers and technicians who work on green buildings and systems, an incubator for green startup companies, a product demonstration and testing facility and an educational facility for K-12 students to learn about the environment, science, math, engineering and technology. The goal of the collaborative was to bring together in one place the green leaders in academia, industry and labor who can together work to turn Pittsburgh into a leader in emerging green technology markets and concurrently prepare a green-trained work force. A year later, Senator Jim Ferlo’s office has announced the 2009 schedule for Pittsburgh Green Innovators. For more information, contact Sen. Ferlo’s office at 412.621.3006 or email pittsburghgreeninnovators@gmail.com. The 5th Anniversary of GREEN DRINKS, the Pittsburgh Green Innovators Project event, will be held on Friday, March 20th, 2009, 5-8 pm at the Bloomfield Bridge Tavern. The evening’s host will be State Senator Jim Ferlo and as an added attraction, you can meet Senator Ferlo’s robotic friend “Solo”! So, this is a business/social/networking event. It might also be an interesting environment in which to meet your senator–he probably doesn’t bring that robot just anywhere. GREEN DRINKS, Friday March 20, 5-8 pm. Complimentary beer and snacks, cash bar open. Bloomfield Bridge Tavern (smoke free), 4412 Liberty Ave., Pittsburgh, PA 15224. For more information about the organization, check out the Green Drinks website. 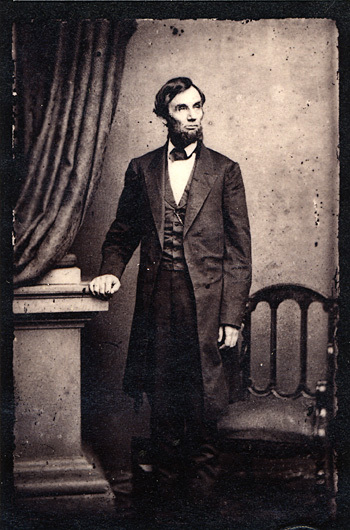 In recognition of the 16th President’s Bicentennial Birthday and to promote the preservation of Abraham Lincoln’s life and legacy, State Sen. Jim Ferlo (D-Pittsburgh) will host a kick-off event for the “Give a Lincoln for Lincoln” campaign. Along with Mayor Luke Ravenstahl, the History Channel, Outback Steak House, Comcast, Pittsburgh History and Landmarks Foundation, PNC Bank, and other local sponsors, the campaign encourages Americans to donate Lincoln-head pennies and five dollar bills to raise funds for education and preservation programs at six historic Lincoln landmarks. Along with remarks by Senator Ferlo and Pittsburgh Mayor Luke Ravenstahl, representatives from the Heinz History Center, AETV-History Channel, and students with the Pittsburgh History and Landmarks Foundation will be highlighting the details of the Lincoln bicentennial celebration nationwide as well as local tributes to history and preservation. Honest Abe himself is expected to make an appearance to talk about his one visit to Pittsburgh back in 1861. Local students will also be recognized for their winning submissions to Senator Ferlo’s Public Art In Public Places Contest. Additional information can be obtained by visiting www.History.com/Lincoln or by contacting Sen. Ferlo’s district office (412) 621-3006, or by visiting his website at www.senatorferlo.com. State Sen. Jim Ferlo (D-Pittsburgh) announced today that $100 state income tax credits are available to active volunteer firefighters, volunteer ambulance personnel and rescue-company personnel. Ferlo added that eligibility for the tax credit is based on a point system. Responders accumulate points through things such as the number of calls responded to by a volunteer, training and participation in drills and time spent on administration, maintenance of facilities and equipment and support activities. Responders must have earned a total of 50 points between Jan. 1, 2008 and Dec. 31, 2008. The application must be signed by the primary volunteer company’s president or chief certify. The form should be filed with the first responder’s state income tax return. “PA Schedule OC-V” and “Schedule OC” forms are available through Ferlo’s website, www.senatorferlo.com. These forms can also be obtained by calling the Pennsylvania Department of Revenue at 1-800-362-20. For those who want to file their returns by mail, the Revenue Department has established a special mailing address for tax credit-eligible volunteers: PA Department of Revenue, Volunteer Tax Credit, P.O.Box 280400, Harrisburg, PA 17128-0400. State Sens. Jim Ferlo (D-Pittsburgh) and Sean Logan (D-Monroeville) will welcome Pennsylvania Acting Secretary of Labor & Industry, Sandy Vito and the Bureau of Occupational Safety to Tarentum for a luncheon and panel discussion to discuss the Pennsylvania Uniform Construction Code.The luncheon will be held Friday, November 7 from 11 a.m. to 2 p.m. at the Clarion Hotel 300, Tarentum Bridge Road, New Kensington. The luncheon and panel discussion will be an opportunity for local elected officials, code enforcement officers, business and trade organizations, building professionals and policy makers to discuss UCC implementation to date and learn more about compliance obligations, expected changes and new challenges. More than 90% of Pennsylvania’s 2,563 municipalities have elected to administer and enforce the UCC locally, using their own employees or third-party enforcement agencies. Some municipalities have opted out, leaving the Department of Labor & Industry responsible for commercial code enforcement. The luncheon will include a Q&A session that will give both attendees and Labor & Industry staff the opportunity to clarify some ambiguities that exist in the code. One further objective of the discussion is to improve communication between the bureau and the communities they serve as we move forward. The event is free to the public, but those wishing to attend must RSVP by contacting Senator Ferlo’s office at 412-621-3006. Article 1, Section 27 of the Pennsylvania State Constitution guarantees the right of all Pennsylvanians to “pure water.” Not only that, safe clean water is necessary for recreation activities and industry. Pennsylvania has an abundant supply of water, so we must do what is necessary to protect, preserve and improve our water systems. O﻿n November 4, General Election Day, voters will be asked to authorize bond funds to improve Pennsylvania’s drinking water and sewage treatment systems. Pennsylvania’s aged water and sewer systems are in disrepair and in dire need of rehabilitation and refurbishment. The approval of the ballot initiative will generate $400 million to reconstruct or replace dilapidated waste-water treatment facilities or obsolete water systems statewide. These grants and loans should help communities begin projects without raising local taxes and fees. The bond will not require any new tax or fee, nor will it require the increase of any existing tax to repay the $400 million. In many communities, the federal government has mandated improvements leaving local governments with no choice. Without the state’s help, local authorities would be forced to turn to water and sewer users to pay for the upgrades. Local taxpayers would absorb all the costs. The $400 million from the ballot initiative, combined with another $800 million earmarked from gaming funds to refurbish the water systems, will lessen or eliminate the need to raise local fees. This is a good investment in our future. As a member of the 30-member Sustainable Infrastructure Task Force convened by Gov. Edward G. Rendell, I participated in a process that estimated the necessary investment in statewide drinking water and wastewater systems. The numbers are staggering. We will need to invest at least $36.5 billion over the next 20 years to maintain reliable service. These bond funds give Pennsylvania a great start toward this future. I urge voters to say YES to clean drinking water. Say YES to clean water for swimming and fishing and other recreational activities. Say YES to a continued investment in the health of our families, increased tourism and more quality jobs in Pennsylvania. Not only will you be voting to ensure your family has safe, quality drinking water, you will also be supporting 12,000 new Pennsylvania jobs that could be created to make repairs and upgrades that are needed to strengthen our water and sewer systems and, eventually, our economy. A YES vote is a vote to invest in Pennsylvania’s future. Abundant water supplies in our state will give us a competitive advantage nationally if we make the proper investment. With clean drinking water, we create and maintain healthy families. On Tuesday, November 4, General Election Day, please VOTE YES on the ballot question.